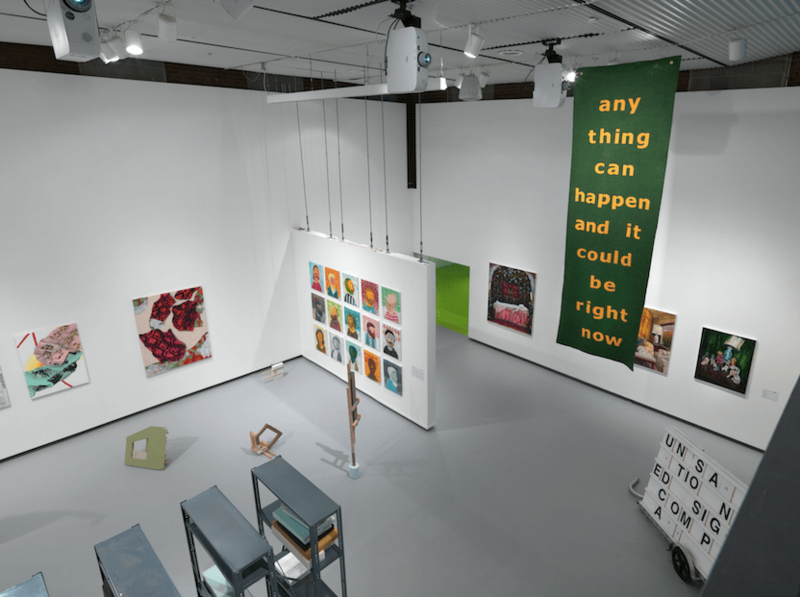 Continuing a biennial tradition that began in 2010, this year marks the fourth iteration of “Ground Floor” at Hyde Park Art Center, showcasing the work of recent MFA graduates from the top art programs in Chicago. The artists in this year’s exhibition aren’t afraid of color. They aren’t afraid of the ground either: trailing work across it, tracking dirt and debris over it, letting ice drip on it, and, in many cases, requiring that we stoop down very close to it. Embracing materials in experimental and often playful ways, these emerging artists collectively form a show that is boisterous and bold, sustaining that exciting buzz of creative energy which manifests itself in very different forms. The faint, sweet scent of mint lingers around Gulsah Mursaloglu’s wonderfully strange installation, which involves—among many other elements—strings of rectangular beads formed from toothpaste, which fall from ceiling to floor. The piece feels laboratory-like, mysterious and provocative in its experimentation with materials that are rarely seen in the forms they take here. In Jeanne Donegan’s seductive video work, on the other hand, the sparse and intimate frames highlight the artist’s own body, with desire depicted as swelling, palpable thirst. The work of Angela Lopez, though less colorful than many of the works in its company, feels particularly mature. Moving through a variety of media, from video to fur to beeswax, Lopez captures undercurrents of internal, animalistic impulses, with skilled restraint that heightens a sense of visceral tension.